Worked on the redesign of the Film Location Database from the initial concept to reviewing design, collaborating on content, QA testing, and launch at the end of 2017. Updated features in response to user feedback. Launched a search tool back in 2016 for the Digital Location Library to pinpoint features within the photo collection. Redesigned the tags in the photo library to filter search results by specific keywords. 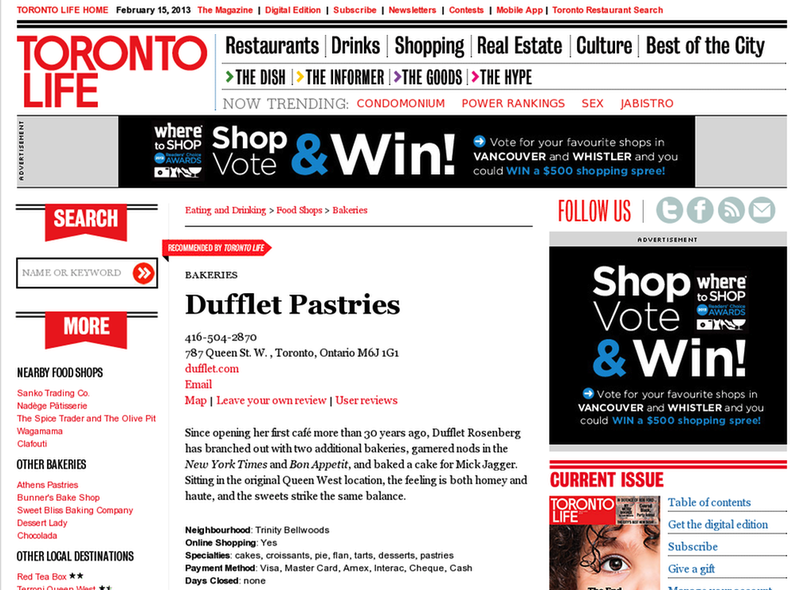 Torontolife.com restaurant search page screenshot. 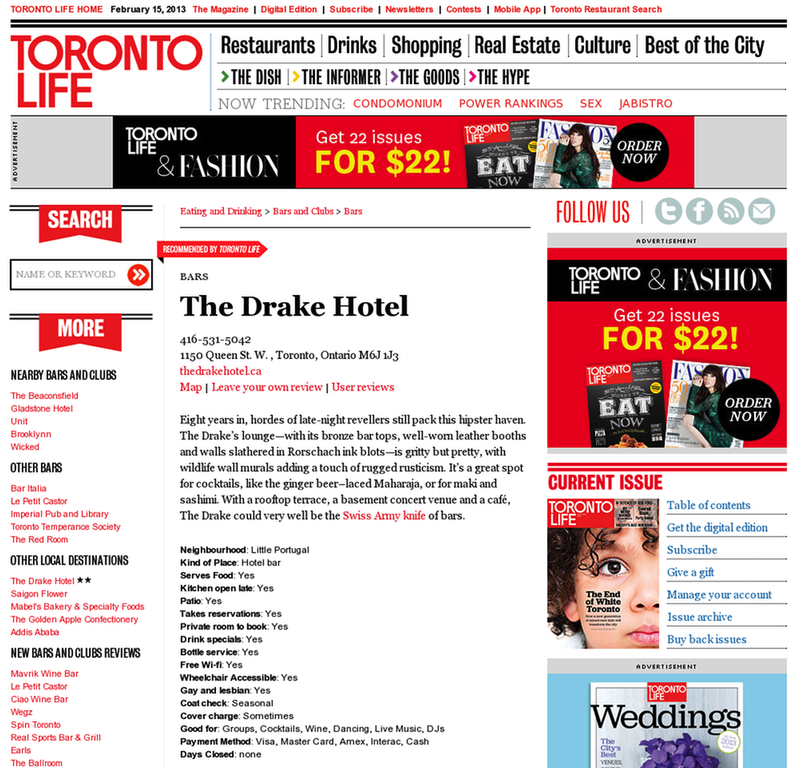 The Toronto Life online eating and drinking guide consists of more than 1500 restaurant, food shop, and bars & clubs listings. As the listings database editor, I helped redesign and relaunch three databases, as well as coordinated the expansion of the online restaurant guide, increasing the initial 400 business listings to just over 1000. By combining content from the 2013 print edition with data collected from a large-scale research project, every record was updated with useful detail (metadata) such as restaurant contact info, social media links, whether the establishment is wheelchair accessible, takes reservations, delivers, offers free wi-fi and other services. As a result, a powerful search tool with better search functionality was produced to improve the retrieval of the listings and to enhance user experience for this online resource. Similar to the restaurant listings, the food shop listings were re-researched to feature information about payment methods, store specialities and online shopping. The bars and clubs guide now lists details about drink specials, cover charges, whether the kitchen is open late and many other services. Where.ca is a Canadian travel website containing thousands of business profiles on the nation’s major tourist destinations. To better organize the information, I devised a master list of categories (e.g. accommodations, activities & sports, attractions, art galleries & museums) and subcategories (e.g. activities & sports – fishing), which I implemented on the regional homepage of Where Toronto. By using controlled vocabulary, the listings are easier to navigate and search-engine optimized. Scholars Portal is an electronic resources service for 21 university libraries in Ontario. The digital library contains more than 500,000 ebooks from academic publishers, public collections, as well as out-of-print material from sources like the Internet Archive. I enhanced metadata of new and old titles using cataloguing practices and principles.